Don Hamlet is the most attractive tourist site in Viet Nam’s Central Highlands province of Dak Lak. Located in Ea Huar Commune, Buon Don District and about 36km west from Buon Ma Thuot, the hamlet is famous nationwide as being a legendary land for elephant hunting and taming, and home of many skilled elephant hunters, including Khun Yu Nop and Ama Kong. Located on an isolated island on the Serepok River, Don Hamlet is endowed by nature with a wild, yet diverse natural beauty. It is surrounded with forests and mountains, and crossed by the Serepok River – all creating favorable conditions for the establishment of a local unique culture. A local guide took us to an ancient stilt house in Tri A Hamlet where we were told many interesting stories about the elephant “king hunters” from Don Hamlet. The stilt house is said to be over 130 years old and has two compartments built with good timber. The roof is also made with wood and skillfully carved by hand. Inside the house, there are many exhibits relating to elephant hunting and taming by hunters Khun Yu Nop and his grandchild Ama Kong. 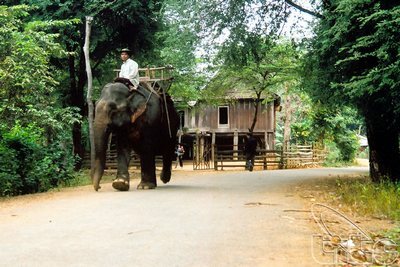 Visiting Don Hamlet, any visitor can have an elephant ride. The elephants, each weighing about three tonnes, are standing high and ready to carry any passenger under instructions of the mahouts. They cross streams and walk through forests for passengers’ sight-seeing. When crossing the stream, the elephants often walk very slowly, which creates a thrilling experience for the passengers. After an elephant ride, we walked on a suspension bridge over the Serepok River, which is built from the trunks of the 300-year-old Si (Ficus microcarpa) tree. The bridge is about 1km long with different portions made with bamboo and rattan and tightly attached together. Standing on the bridge, we could see vast leaf canopies covering a large area of over one hectare, many of them made by the trees’ small roots that created strange shadows. On peak days, the guide said, there are about 1,000 tourists crossing the bridge. Don Hamlet is beautified by the silky Serepok River, which runs through the York Don forests and consists of two branches of the bigger Drong Na River. At sunset, the dug-out canoes rowed by the local people glide on the sparkling river surface, bringing wonderfully romantic moments to the tourists. At night, we enjoyed the locally-distilled wine by using straws to drink it from the big jar. Sitting near a fireplace and watching the local artists to dance amid the sounds of the gong, we had such a special feeling of truly being central highlanders while fully enjoying their unique culture. Touring Don Hamlet, visitors will have special experiences in exploring the local land and people. Breaths of the wind, fragrance of the flowers, grass and trees, the wild natural environment, and above all the honesty and hospitality of the Central Highlanders, will impress any visitors for a long time after their trip to the locality.